The entrance to the Laurel Canyon development is on Hwy 140 West about 2.5 miles from Hwy 5/ SR20. It is about half-way between Canton and Waleska and located directly across from the Great Sky Development. After turning onto Laurel Canyon Parkway, proceed about 1.5 miles to the Solie Gatehouse. Beyond the gate you will find one of the best neighborhoods in the country to live. 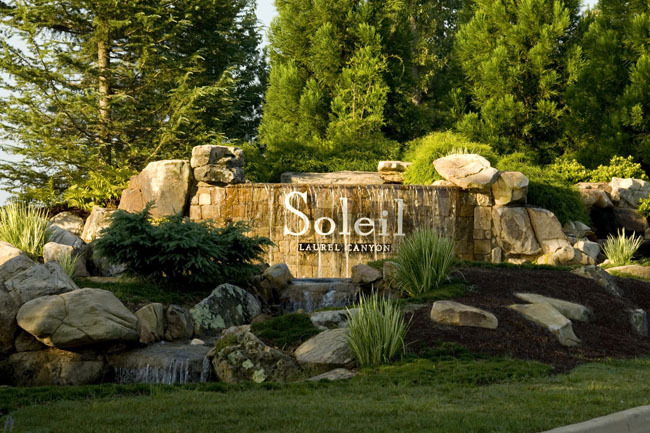 Solie is described as an "Active Adult" community. Here you will find great neighbors and good times. Established in 1832. Named for the Cherokee Indians. Before whites invaded the land west of the Chattahoochee both the Creek and Cherokee Indians called it home. Although these Native Americans could not conceive "owning" land, they battled for control a number of times, most notably at Blood Mountain and later at the north end of Cherokee in a town now called Ballground. The oral history of both tribes describe Taliwa, either a ball game, lacrosse, or a battle that took place here probably in the mid 1700's, possibly 1755. The outcome of the meeting determined control of the land and the Creek lost. Early Native American settlements in the county were near present-day Canton, Sixes, and in the southeast corner of the county, among others. White encroachment on the land began as early as 1800, possibly earlier. The old Federal Highway, completed in 1805, ran in the northeast part of the county. By 1824 only a trickle of men had moved onto Cherokee land, although the original mill at Sixes was probably already in operation by that time. That year, following the election of Democrat George Troup as governor of Georgia, a self-avowed "indian hater", whites began to encroach on Native American land across the Chattahoochee. By the time gold was discovered the trickle had become a flood and a county known as Cherokee was formed on December 26, 1831 with 6900 square miles of territory. The first court was organized and held in present-day Pickens County at the Ambrose Harnage house near Tate, Georgia. Almost immediately the state realized it had made a mistake creating a county so large and passed legislation that broke the original Cherokee County into 10 smaller political units(eventually 24 counties contained at least part of this land). The 10 Counties created from the original Cherokee County are Forsyth, Lumpkin, Union, Cobb, Cherokee, Gilmer, Cass(now Bartow), Murray. Floyd. and Paulding counties. An itinerant court settled in the tiny town of Etowah, beside the river of the same name. Shortly thereafter the town became known as Cherokee Court House. When a group of enterprising businessmen tried to establish a silk industry they created the town of Canton, a mile east of Etowah, named after the China silk capital. Starting in the early spring of 1838 most of the remaining Cherokee were rounded up and herded into filth-ridden and vermin-infested "Cherokee Removal Forts" in preparation for the "Trail of Tears." The largest of these forts, Buffington, was 5 miles east of Canton. Cherokee County also shared in Georgia's Gold Rush. Cherokees mined gold in the county in the late 1700's and by 1819 white miners had probably moved into the area around Sixes Mill. In 1830 members of the infamous Georgia Guard from Camp Hinar Sixes destroyed the equipment of Cherokee miners in the area. The camp, which is also referred to as Fort Sixes, was also used as a Cherokee Removal Fort. Placers and mines were in use until 1913. The old Federal Highway served the miners with supplies and by transporting the gold to markets further north and west. Portions of the roadbed are still visible in the county. In 1853 Cherokee County gave land to create Pickens County, and in 1857 gave land to become Milton(now Fulton) County. During the Civil War Cherokee and Pickens Counties remained strongly pro-Union, even after the initial Rebel victories. Community leaders were stunned when William Tecumseh Sherman ordered the town of Canton burned in October, 1864, possibly because then governor Joseph E. Brown lived and worked in the area for a number of years. Another possibility is that a group known as "McCollum's Scouts" had threatened local Union sympathizers. Mill at Sixes, an old Cherokee townCherokee evolved slowly from rural to agrarian to industrial to bedroom community. With the arrival of the Marietta and North Georgia Railroad in the late 1870's the county started to develop both agricultural resources and industry. The year service got to Canton (1879) so did Robert Tyre Jones. R. T.'s general store grew to be the largest in north Georgia and a rural aristocracy began to form around him and Sam Tate, his neighbor and friend in Pickens County. The Cherokee Advance began publication in 1880. The mill at Sixes, which had been unproductive for some time, was rebuilt with a metal wheel, and Ballground was a major manufacturing center for jugs. North Georgia, including portions of Cherokee, was dependent on income from "moonshine." About this time, near the tiny town of Waleska, Georgia, in northwestern Cherokee County, ancient petroglyphs were uncovered much like those at Track Rock Gap further north. In 1892 the Bank of Canton began in Cherokee. At this time banks were uncommon in North Georgia, in part because of a crop-lien system that had developed between the farmers and general store owners. Store owners would loan money to the farmers to buy seed and other things, then get paid back after the crop came in. The growth of the poultry market here brought the title "Broiler Capitol of the World," which another Georgia county, Hall, took from them after the emergence of large production farms in that area. Cotton, long a staple of the area's cash-lien farms, brought much wealth and misery. As farmers grew dependent on the crop and the cash it generated, they reduced the amount of food crops grown. When the market vanished in the early 1920's and the boll weevil destroyed crops Cherokee suffered so dramatically that it did not begin to recover until after World War II. Automobiles effectively ended the mule trading market the city developed. Canton denim was manufactured by a burgeoning fabric industry, but with the passing of natural fiber clothing that too died. The county now serves as a bedroom community less than an hour north of the city of Atlanta. Dean Rusk, Secretary of State under John Fitzgerald Kennedy, grew up in the southeastern corner of the county. A middle school less than five miles from his ancestral home bears his name. During the last decade of the 20th century Cherokee County often struggled with its change from rural to urban community. In 1991 Cherokee was the last major metropolitan county to replace the "one-man" rule with an elected board of commissioners. The Southern Association of Colleges and Schools placed the entire Cherokee County School System on a one-year probation starting in December 1998 for allowing board members to threaten and interfere with school employees. Cherokee's troubles continued when defeated County Commission Chairman Hollis Lathem and others began "rubber-stamping" zoning variances. A modestly successful politician, Lathem was soundly defeated by political newcomer Emily Lemcke. Lathem also withheld tax bills with 20-40% increases until the day after election.